After earning a B.A. 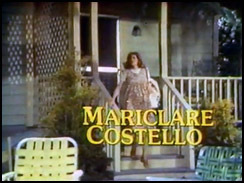 from Clarke College in Iowa and an M.F.A from Catholic University of America in Washington DC, veteran actress Mariclare Costello notched a number of very high profile Broadway appearances and stage roles. 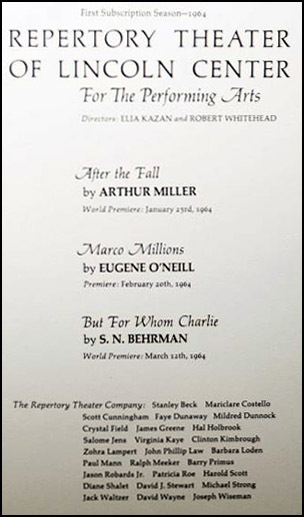 As one of the first members of the new Repertory Theater of Lincoln Center, she shared the stage with Jason Robards and Barbara Loden in Arthur Miller's After the Fall (1964) -- directed by Elia Kazan, no less -- and acted with Faye Dunaway in S.N. Behrman's But For Whom Charlie (1964). She also starred with Maximilian Schell in John Osborne's A Patriot For Me (1969), and appeared alongside Helen Hayes and Jimmy Stewart in Mary Chase's Harvey revival (1970). 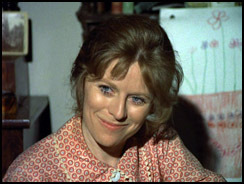 Later, she served up a healthy cache of work on both the big and small screens, including recurring roles on the classic television series The Waltons (1971) and The Fitzpatricks (1977), as well as parts in the critically regarded drama The Execution of Private Slovik (1974), Robert Redford's tale of dysfunction Ordinary People (1980), and the horror anthology Nightmares (1983). 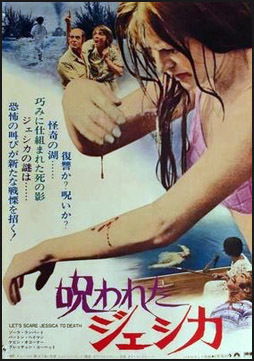 Genre fans will know Costello best for her supremely creepy turn as Emily Bishop in John Hancock's sleepy cult classic Let's Scare Jessica to Death (1971). There, she played to perfection a mesmerizing vampire-ghost who terrorizes her hapless (and mentally unstable) new friend Jessica (Zohra Lampert). These days, Costello teaches acting, and most recently conducted a series of classes for youths at Homeboy Industries. She agreed to sit down with us and discuss her memories of working on Let's Scare Jessica to Death some forty years ago. The Terror Trap: What are your first memories of acting? Mariclare Costello: I’m from Peoria, Illinois. I had two older sisters and two male cousins from Chicago, who were super, super smart. One ended up in the CIA. They would come down to Peoria to visit us, and they and my sisters would write plays for us. We would do the plays in the basement. I remember my first appearance was in that basement, where we had an old icebox because we had changed to a refrigerator and this thing had been sitting there. Because I was so young, there wasn’t much for me to do in the play. But at the end, somebody opened up the icebox and there I was. At which point, my parents and my aunt and uncle and everybody in the audience just gasped. They were so horrified that I had been in there. TT: Wow! Were you able to breathe okay? MC: (Laughs.) I didn’t have any problem with it at all. I do remember it kind of visually, but I don’t recall the emotion of it. I’ve been told about it many times. TT: How old were you, do you think? MC: I was about four or five. Very little. TT: Was it at that point you knew you wanted to act? MC: No, I didn’t. I wasn’t thinking about that then at all. In high school, I did audition for a big variety musical show. And for some reason, they made me the student director of it. I was basically extremely shy and quiet at that time, although probably not anymore. That was a very outgoing thing for me to have to do. TT: Did you enjoy that? MC: I loved doing it, and also I was in it with a friend of mine who is a star athlete. We did a song together and it was hugely successful. TT: Do you remember what song it was? TT: Where did you go to school to hone your craft? 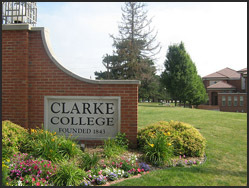 I went to Clarke College in Dubuque, Iowa. That’s where my sisters went also. It's a very small girls school, with probably about 400 people when I was there. My sisters majored in drama, and I always loved primarily musical comedies. MC: Yes, that’s what I loved. I would listen to the LP records of musicals. My parents took all of us to Chicago to see Up in Central Park, South Pacific...and Carousel, which was the second musical I saw and my favorite. That did it for me. Do you know that musical? MC: It’s extraordinary. It was the darkness of it that got to me. TT: Right, it has a darkness and depth that’s different from other musicals. TT: You were a teenager and that’s when you realized you wanted to do this? MC: Well, I was in grade school, a teenager. Periodically, my parents would take us up there and we would see the big musical that was happening at the time. They were just KILLER musicals. So I'd say that Carousel did it for me. TT: Did you major in theatre at Clarke? MC: I did. I got the most extraordinary training there that anyone could imagine. TT: Who woulda thunk it? Dubuque, Iowa! MC: Absolutely! And in a girls school, where there were 100 students in my class. The reason I got good training is because it was small, and we had a brilliant nun there who had us all subscribe to Theatre Arts Magazine. The minute it was published, I read Eugene O'Neill's A Long Day's Journey Into Night, when I was about seventeen. I got to act, direct, do the sound, the lights, the set - everything. I did it every day. When you’re a theatre major, all that stuff happens at night. It was very intense and I just had the best time. In my junior year in college, I was encouraged to go to the University of Vienna. TT: Nice. And you went? MC: I went. On the way, my parents drove me to New York to catch the boat. While I was there, I was able to see A Long Days Journey Into Night, which I had read and had fallen in love with every line of it. I saw Jason Robards and Fredric March in that. 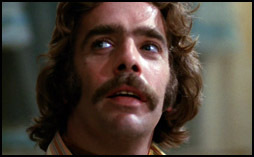 TT: You'd end up working with Jason Robards just a few years later, correct? MC: Right. Later, I worked with Jason in a number of plays. We became very close friends. So I saw Jason and Bradford Dillman, who played the brother. For that to be my first Broadway play…can you imagine? Then you made it to Austria. MC: Yes, where I got to go to the theatre and standing room at the opera all the time. Also, I saw Laurence Olivier and Vivien Leigh in Titus Andronicus. This would probably have been around 1957. TT: Amazing. Vivien is one of tragic cinema's greats. Probably as a result of the troubles she had in her own life. MC: She was extraordinary. But she had a tough life. TT: That’s a very bloody play. MC: Yes, they cut off her hands and her tongue. I’ve never seen it since. Nobody does Titus Andronicus. TT: They should. Titus Andronicus is really Shakespeare's only pure horror play. It's like his ode to terror. MC: Well, it’s a hard one. It’s a very hard thing to stage. Anyway, that was my junior year abroad. I came back and finished school. I was on a waiting list and got a scholarship at Catholic U and went there for two years to graduate school. At the time, they had an extraordinary theatre department. There were wonderful teachers and classes. That's where Walter Kerr, the great theatre critic, was from. A lot of really amazing actors were out of there. Frannie Sternhagen, Philip Bosco...people whom I met subsequently. And when I finished there, they had a touring company that toured the United States with Shakespeare called Players Incorporated. They were doing a tour of Aeschylus' Oresteia and The Merchant of Venice and they asked me to play Clytemnestra and Nerissa, respectively. We played schools. One-night stands, basically. We all went to New York after this tour. I worked Off-Off-Broadway and Off-Broadway. I was an understudy in The Hostage and then ended up taking over from the leading lady. I was substitute teaching in Harlem as well. 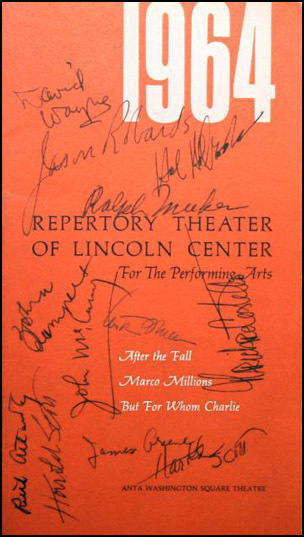 At that time, everyone in New York was auditioning to be in the training program, which was an audition process, for the New American Repertory Theater of Lincoln Center. I think hundreds of people auditioned and they took thirty. I was one of the thirty. For a year, we studied with Bobby Lewis -- the founder of The Actors Studio -- and Elia Kazan, Harold Clurman and Jose Quintero. I mean, the major people in theatre. We studied eight hours a day, and then I would work in The Hostage at night. 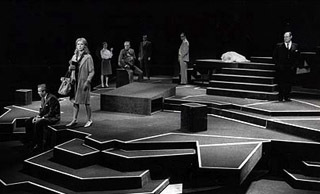 TT: What was your first production with the Repertory Theater? 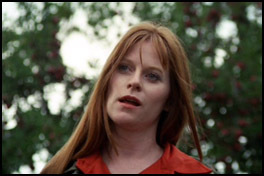 MC: It was Arthur Miller’s After the Fall with Jason Robards. Zohra Lampert was in that. But you know, at that point, I really felt like I didn’t know what the hell I was doing! So I went and studied acting with a teacher by the name of Mira Rostova. She was a Russian emigre who had developed her own brand of Method acting. 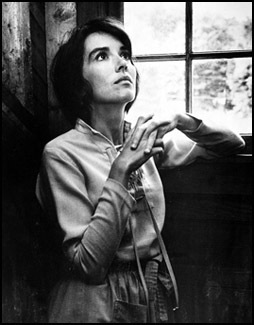 She had worked with Montgomery Clift and some others. Anyway, I went to her class and I learned a lot. TT: Wow. 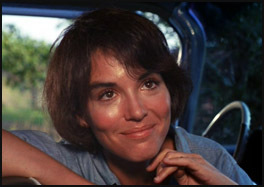 Now, Zohra Lampert would be as good a segue as any into reminiscing about Let’s Scare Jessica to Death. How did that film come your way? MC: One summer (I don’t remember where I was) I got a call to come to Old Saybrook, Connecticut. The girl who they had for my role -- the role of Emily -- had been let go, for whatever reason. TT: Had you met director John Hancock at that point? MC: I might have met him before the film. But I never auditioned for Jessica. It’s possible Zohra may have had a hand in having them call me. TT: So you never read for the role of Emily? MC: I never read for the part, never read the script. The script was delivered to me and I probably read it in the plane on the way over to Saybrook. TT: Were you still in New York then? MC: I think I was out here in California because the man I married moved here in 1970. Although at the time, I was going back and forth between California and New York, where I was doing a play on Broadway. TT: Had you stayed in contact with Zohra since you appeared with her in After the Fall? MC: No. But she and I were both in Mira Rostova’s class and I would see her there. 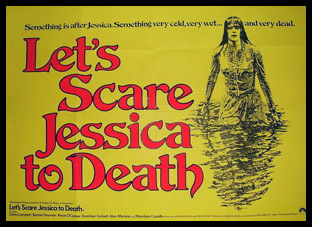 TT: The script for Let’s Scare Jessica to Death was based loosely on Joseph Sheridan Le Fanu’s Carmilla, a Gothic vampire novella first published in 1872. And of course, it also pays homage a bit to Henry James' Turn of the Screw. What did you think when you first read it? MC: Well, of course my first reaction is that I was working on it. It wasn’t like I was evaluating it as a script or a piece of literature. I knew it had to be good enough that at least Zohra was in it. I never viewed it ever like that. For me, it was a job. TT: How did you see the character of Emily? MC: (Long pause.) Oh, gosh. I remember just working on it piece by piece. Line by line. Scene by scene. I don’t have any big ideas about it. We broke it down that way. TT: What was John Hancock like? MC: He was a total sweetheart. He was just very quiet and gentle and sweet and supportive. A lovely guy. He made a great baseball movie, didn't he? TT: Yes. Bang the Drum Slowly (1973) with Robert De Niro. Now, once you got to the set of Let's Scare Jessica, do you recall any anecdotes you’d like to share? MC: I remember one very clearly. 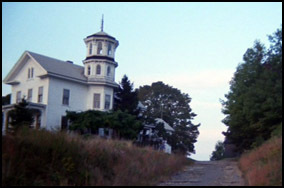 There’s a scene in that house where I was in costume. A person on the crew told me we were going to shoot the interior sequence with the mouse. I think it was supposed to be a mole. I was told I was the only cast member in the shot, and that this was where I was going to kill the mouse. TT: What did he say? MC: We’d just been told what the scene is. Right there, on the spot. And honestly, I don’t know whether it’s true that they wanted me to do that. You’ll have to ask John. TT: You mean you’re not sure whether the director wanted this -- or whether the crew person was just asking you to do it? In any case, I hid. I found this car where nobody was around, and I got in the back seat and hid on the floor. And I had told them I wasn’t going to do it. TT: Aren’t there laws against killing an animal for a film? MC: Yes. But I didn’t know what John Hancock was going to do. I didn’t know if they were gonna follow the law. TT: What did they end up doing? MC: They shot something but I’m not in that shot. I never, ever showed up for it. Somebody found out where I was and at some point, John came and opened the car door. And there I was in my white dress or whatever. I was like a scared mouse myself, on the floor hiding. TT: What did he say to you? MC: He said, “Come on out.” I had to get out. 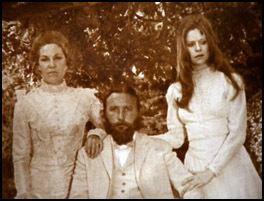 And so there's this shot of someone with the white dress and the mouse in the film. TT: So was this animal actually killed? MC: I’m not sure. I really don’t know. TT: There’s a shot of a hand sticking a knife in a glass bowl but you don’t see it actually touching the mouse. MC: Yes, they had to solve it some other way. TT: Let’s talk about that house for a moment. It’s almost like a character itself. What’s your recollection of that setting? MC: It was beautiful. Oh, I loved that house. I lived in Illinois in a house that was built by General McClellan of the Civil War. A big, white-framed house with a porch. Not as big as that house in Old Saybrook. But I just loved the rooms, everything about that house used in Jessica. TT: Was anyone residing there at the time? MC: I can’t recall. But I have a feeling we met somebody and they were really making money by renting it out to the movie group and the producer. It was in very good shape [at the time]. TT: Not dank and grey like it appears in the film? MC: No, not dank at all. That's probably the lighting. We had a good designer who put it together. TT: Zohra is quite good as the frail and mentally unstable Jessica. What did you think of her and her performance? MC: Well, as I mentioned earlier, she and I worked in acting class for several years prior to this film, and I was on the stage a lot with her in After the Fall. 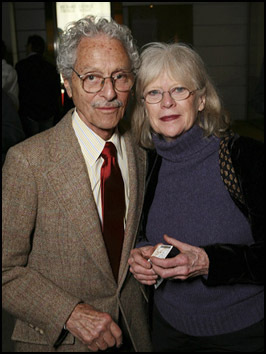 I also was on the stage with her in Marco Millions, the play by Eugene O’Neill. Zohra’s just a brilliant actress and I’ve always felt that. I felt that while we were making Let’s Scare Jessica and I feel that every time I see her perform. She's so very talented. TT: A very unique and interesting actress. She makes the audience watch her. MC: Oh, yeah. Oh my God, yes. TT: The "voices" Jessica hears in her head...that’s you, correct? MC: You know, I don't know. I haven’t seen the movie in forty years all the way through. TT: We think you can tell it’s your voice. It sounds like you. The voices are telling her mean and negative things. MC: That’s a plot point if it’s coming from me. I’m sure it was recorded in that case. TT: Any thoughts about the two males, Barton Heyman, who played Jessica's husband Duncan, and Kevin O’Connor, who portrayed their friend Woody and the character who takes an interest in you? MC: Those guys were great. They did more things in New York and I was always glad to see them. Lovely guys. 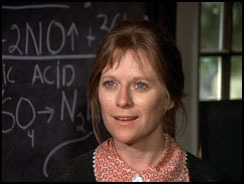 TT: How about Gretchen Corbett? MC: We didn’t have any scenes together. 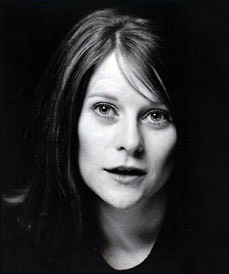 But the interesting thing about her is that I have a daughter that directs plays in New York, very successfully. They’re doing Much Ado in San Diego at the Old Globe, and I read the cast list and Gretchen’s daughter Winslow is in it. She has the lead. Did you have any interactions with the residents of Old Saybrook? MC: Not really. We just didn’t have time. We’d start at seven in the morning and be done and then go have dinner someplace. MC: I did put the movie in to look at the credits and I couldn’t watch me in it. MC: I don’t know. It was very...kind of creepy! TT: That’s why we like it! MC: (Laughs.) Yeah, I know. That's why people like it. 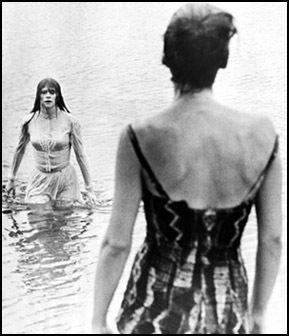 TT: Let's talk a bit about the supremely eerie, well-done scene of you rising from the lake in the wedding dress. Tell us about that. MC: There’s also a scene of us in swimsuits, right? TT: Yes. There’s a scene where the four of you are in the water, and the one in which you and Zohra are playing around and you try to drown her. MC: I’ll tell you the thing about those scenes. That water was unbelievably COLD. We were shivering. Shaking. It was so cold. Can you tell when you watch the film? TT: Yeah, it sure does look cold. They would take us out there and we’d get in the water and shoot until they couldn’t shoot anymore. They’d have to bring us into the trailer we had, and put blankets on us and we would drink hot things. Then go back in to get the next take. TT: What time of the year was Jessica filmed? MC: It wasn’t winter but it was cold. I’m guessing late September/early fall. At one point, we took a shot of whiskey just to warm us up so we could go back in and shoot more. TT: You have to be careful with that stuff because you can get hypothermia. MC: Oh, absolutely. And I remember they WERE worried about us. It wasn't just us worried about ourselves. A few of the crew were in there also and they had to deal with them too. TT: Did you have any problems or mishaps filming the sequence where Emily and Jessica are tussling in the lake? MC: No, I seem to recall that going smoothly. TT: Tell us about the scene in which Emily sings at the dinner table. MC: I sang that song myself. Long after we finished filming, I got a phone call and was told they wanted me to sign a release because they were going to dub it with someone else. TT: Huh. What was your reaction? MC: I said, no, I didn’t want to do that. I told them I know I’m not a singer, but I just hate it when I'm watching a movie and suddenly this great singing voice comes out. MC: Right, like Marni Nixon! I just think it’s so wrong when you see that in some films and you just KNOW it’s dubbed. It’s distracting and you spend one minute thinking, “Oh, that’s dubbed. That’s somebody else singing the song.” You start watching the mouth and the lipsynching. TT: The singing does sound like your speaking voice. And it’s great you held your ground. It really fits Emily’s whole hippie persona. MC: The fact that she could sing as much as I could sing...well, it seemed right to me. I’m not even sure they needed my permission. I didn’t expect when I first saw the movie that I would be singing, but I did realize I was and I thought, good for them. They realized it’s better this way. Or maybe they just didn’t have the money to get Marni. (Laughs.) I’ll bet the final decision was probably financial. In any case, I was happy. TT: You also strummed a guitar. MC: Yes, I did have a guitar and I learned a couple of chords. I certainly didn’t learn how to really play it. TT: You touched on going out to dinner earlier. Did the cast spend much time together off the set, going out to eat in town and socializing? MC: Actors always have to have dinner. I believe we had rooms that were rented for us, and sometimes you’re just too tired to go out and can take something back to eat. But we did go to dinner. Zohra and I often went out together, and with the guys a few times. I can’t recall any specific place. It was an "end of the day" kind of thing. The social aspect, and the going out at the end of a day’s shoot, was great and a relief. It was fun and relaxing. TT: Did Gretchen ever join you? MC: No. People in the cast like Gretchen weren’t there that long. TT: Sure, her character is illusory and not in many scenes. TT: Despite the budget, was it a professional atmosphere? MC: Yes. It felt like a very professional, low-budget movie set. TT: The horror genre is often criticized for not being an actor’s medium i.e. there’s no “meat” in the roles, it’s just scares, etc. Yet Let's Scare Jessica is a horror film almost completely defined by the performances. There’s no Frankenstein monster, or special effect gimmickry. MC: I think that’s got to be John Hancock. I mean, he hired Zohra and I, and we were just dyed-in-the-wool actors. So that's what he got. We never did any work other than that. We were just always studying and working and doing the best we could. John picked us and we were simply doing our best acting. You do that no matter what the genre is. He responded to what we gave him and we responded to whatever he gave us. Really, we didn’t have any overall view of the genre at all. We were just trying to make that script come to life. TT: So you didn’t think in terms of the genre? TT: Well, that's true enough. 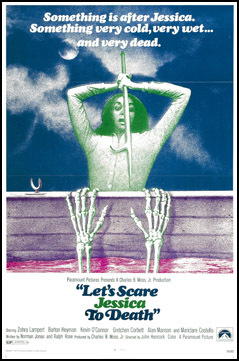 Are you aware that Let’s Scare Jessica to Death is revered and fondly remembered by a great many people? MC: I am aware of that. At some point in my life, people began to say, “Oh, that’s become a cult film.” And so you think, "That’s good!" But yes, I’ve heard it so much that I know it’s very loved and popular with fans. I think that’s wonderful. TT: Are you proud of your work in Jessica? TT: It gets under your skin. MC: And that’s a good thing! TT: We just want to touch on a few roles really quickly. You did some fun things in television in the ‘70s. What do you recall about making the 1975 TV thriller Conspiracy of Terror concerning a Satanic cult? MC: I had a good time on that. We were on location in someone’s house outside of Los Angeles. I knew the cameraman on that movie, which was nice. This might be one I made that I never actually saw after we did it. TT: We’re big fans of John Llewellyn Moxey, the director of Conspiracy of Terror among so many other small screen terrors from that period. MC: John was lovely. Just a nice guy. I had a wonderful time with him. 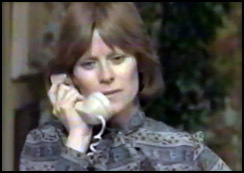 TT: You were Miss Hunter on The Waltons. What was that like? MC: Well, I had the BEST time on that. TT: We love you as Miss Hunter. MC: (Laughs.) Oh, thank you. I had the greatest time with Richard Thomas and John Ritter, whom my character later married. Ritter and Thomas and I laughed from the beginning of the day until the end of the day. We spent a lot of time together. They were great. So many people on The Waltons were really good. There were terrific actors on that show. TT: How about The Fitzpatricks? MC: I remember I had to go see Philip Mandelker, the producer, at some point and tell him I was pregnant prior to shooting. He said, “Oh my God. We will write it in.” SO they wrote it in. All of that stuff about the pregnancy in the series...I was really expecting. My daughter was born during it and she played my child in the show. TT: Oh wow. That’s cool. MC: It was so cool! She was always on the set with me, with a friend who was taking care of her when I was filming. She was right there. They have a few shots of me with her. You did two episodes of Lou Grant. MC: I loved Ed Asner. He was terrific. He knew Mira Rostova, my teacher. If you meet somebody and you have that bond, you suddenly know what the person is talking about. So we had that in common. He’s just a great, lovely guy. TT: You had a part in the 1983 theatrical horror anthology film Nightmares in the story called Bishop of Battle. You were the mother of Emilio Estevez. What comes to mind about that? MC: That was a small role. But it was fun. You know, I guess what comes to mind when I think about Emilio is that I worked with his father Martin Sheen on the television movie The Execution of Private Slovik (1974). I played his wife. Charlie Sheen, who was about nine, was given a walk-on. He wouldn’t go to school. Martin had that problem with him. But he’d come to the set and they put Charlie in a wedding scene. I felt for Martin because of the problems he was having with his son. TT: And years later, he’s still having problems. TT: We have to tell you that one of our favorite films is Ordinary People and you’re in that terrific scene on the golf course. MC: Yeah! That was fun. Robert Redford was the sweetest director. A great guy to be around. TT: Tell us about some of your current projects. MC: Well, I teach acting professionally. I love doing that. And I just completed teaching a short acting course with Homeboy Industries. It's been a really rewarding experience. You’ve done so many terrific things, Mariclare. We didn’t get to delve into your extensive stage work as much as we'd like. But we want to thank you for reminiscing about Let’s Scare Jessica to Death with us. MC: It was my pleasure.